Hey, Catholics! We are celebrating the Fourth Sunday of Advent and the Feast of Christmas, back to back! Book giveaway runs until Saturday!! Don't miss it! 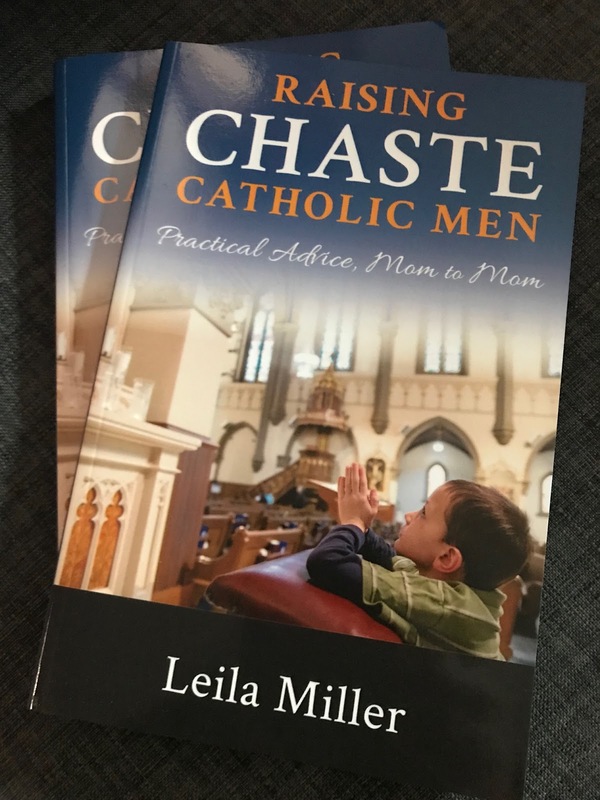 The incredible Leila Marie Lawler has a book giveaway going on her wonderful blog, Like Mother Like Daughter! Head on over, and share! I have always said that you simply can’t ask a child what he thinks about his parents’ divorce. There is too much at stake! For the child to admit that he has received a blow he may not recover from is too frightening. And in almost every case, the child feels he has to protect his parents who are obviously no longer in control of their own lives — if only for his own preservation, for, the child has no autonomy. Without his parents, he will be exposed to nameless danger. No, you must wait until the child has grown. Then you may — may! — be able to find out what happened to his inner life when his world fell apart. This is what Leila Miller has done — she has let the now-adult “child” speak. I had an amazing experience at EWTN studios, and then, with my son who attends college nearby, I went on a little pilgrimage to the Shrine Mother Angelica built, which includes her nuns' monastery and her resting place. This one is a very short Bookmark Brief (like a commercial) and the full interview with Doug Keck will be aired sometime in the Spring. 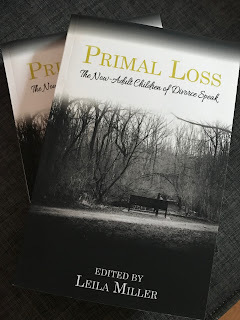 The follow-up book to Primal Loss: The Now-Adult Children of Divorce Speak is going to be a compilation of stories of HOPE (like Chapter 10 in the current book). If you have a story of either you or your parents overcoming a terrible marital crisis and reuniting or finding redemption, please email me your story at primalloss@gmail.com -- and rest assured it will stay completely anonymous! 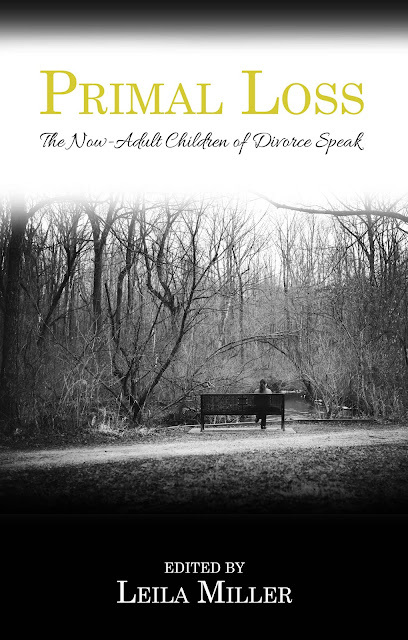 From a Child of Divorce: "What I Wish They Would Have Told Me"
My friend Melody Lyons wrote something two years ago, that, had I known about it then, would have been included in my book, Primal Loss: The Now-Adult Children of Divorce Speak. As the Catholic discussions on divorce, remarriage, etc., increase as a result of current events in the Church, I throw in my unsolicited pennies and beg Catholics to avoid one thing during those discussions: Never, even under the generous umbrella of mercy, allow adult pastoral considerations to divert attention from the great needs of the suffering children of divorce. A faster annulment process (or other changes) may or may not be good for the Church.... But it doesn't fundamentally change the crushing blow that divorce is to the family. Even when it is necessary, it is still a great suffering. "What I Wish They Would Have Told Me"
Since there is a lot going on in the Church right now, it's a good time for all of us to understand something very important and very basic: Infallibility. There is more than one kind (or level) of infallibility in the Church. 2. The "ordinary and universal Magisterium"
The exercise of the "ordinary and universal Magisterium" is less dramatic but more common. It is the teaching of the whole body of bishops, in union with the pope. When the bishops and pope speak and teach definitively on something (for example in an ecumenical council) they are teaching infallibly. The day-to-day teachings of the Church, confirmed and reaffirmed throughout the centuries (taught "always and everywhere"), fall into this category of infallible teachings. "God exists" would be one such infallibly taught doctrine (pretty basic and general! ), as would the prohibition of abortion and contraception (never has the Church sanctioned either one). Like I said, I'm keeping it simple! is the death of his holy ones. Fr. 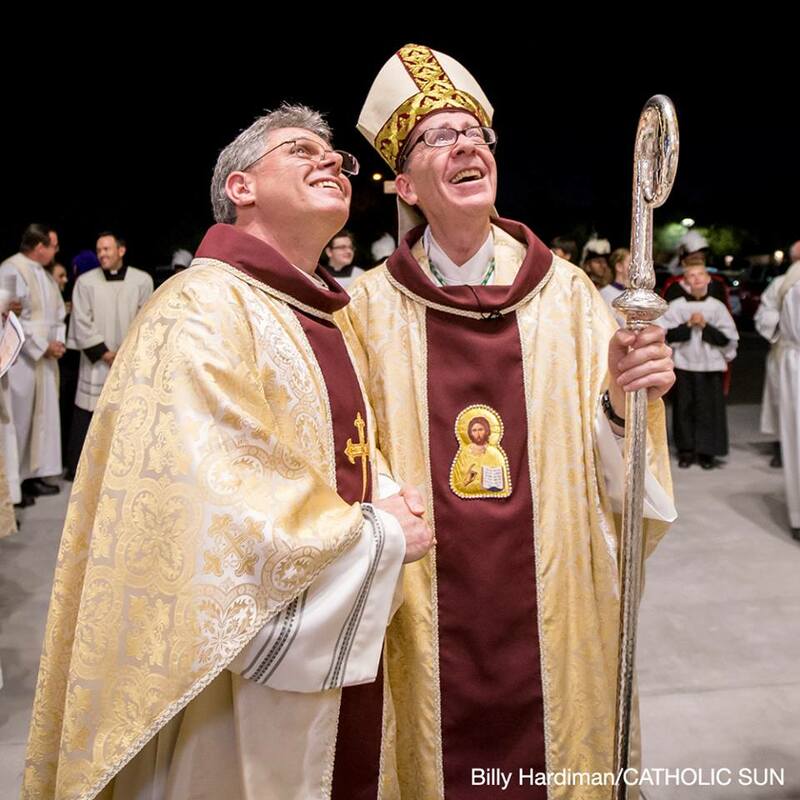 Pete Rossa, the beloved, always-smiling, ever-joyful pastor of St. Bernadette Catholic Church in Scottsdale, Arizona, died last Wednesday, September 13. He was only 52. On the morning of Tuesday the 12th, Fr. Pete had ascended the steps of the ambo to give his homily to the small group of faithful who had assembled for daily mass in the magnificent new church building that had been dedicated only months before. "In the Gospel of Luke, Jesus called the disciples to Himself...."
He then stopped, apologized, and appeared to take a step down. He lost consciousness and fell backwards onto the marble floor, hitting his head. The lector and parishioners rushed to help him, first responders arrived, and soon he was taken into emergency surgery. Despite excellent care, there was nothing the doctors could do; he never regained consciousness. The next day, surrounded by loving family, friends, and brother priests praying the rosary, Fr. Pete, good and faithful servant of God, passed to eternal life. It is a consolation to all and a gift from the Lord that his last conscious moments on this earth were spent surrounded by consecrated, holy things, with his Eucharistic Lord just a few feet from him. Father Pete was robed in his priestly vestments, serving his flock in the house of God that they had worked so hard to build, together. In the lunchroom at the parish office just recently, Fr. Peter shared with some of his staff that when it was his time, he hoped he could die doing what he loved most, celebrating the Sacred Mass. How prophetic, then, that he was called to the Lord and into the loving arms of the Blessed Mother, for whom he held such great affection, only days later in just this way. The Lord clearly loved his servant Peter very much. It’s my great prayer that we continue to grow in the grace of God and to proclaim His kingdom everywhere we go, every minute of the day because you, my brothers and sisters, are not just simply called to come to Mass on Sunday. You and I are called to be saints. God wants that more than anything else, and He is going to pour out the Holy Spirit upon you in your lives for just that purpose. If I were to die tomorrow, it would be my sincerest hope not that I be remembered for this church, but that I would be remembered for bringing you closer to Jesus Christ because that is our mission, that is our hope, that is our longing at the core of our faith. I am not sure Fr. Pete knew who I was, but I sure knew him. I remember reading about his late vocation in the diocesan newspaper 14 years ago. He had been in the Air Force for 12 years, and after having served our country with honor, he got out and began to wonder about God, Someone he had not really known. He went to an RCIA class and asked, to the amusement of the others, "Who is Jesus?" 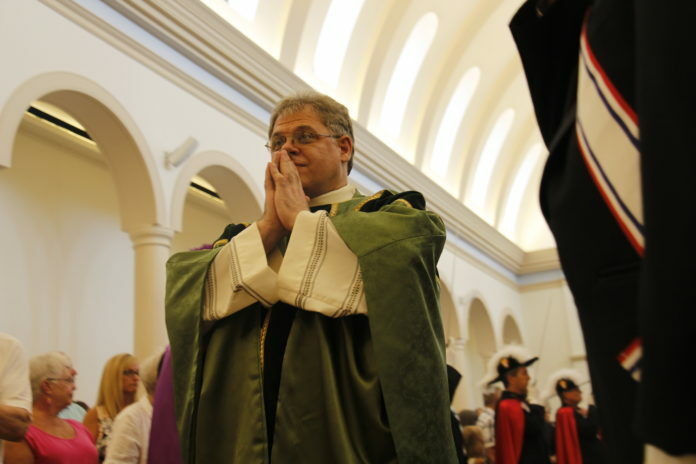 God clearly had Pete Rossa on the fast track, because soon after that spiritual awakening, he was headed to the seminary--and ultimately to 14 years of a holy and fruitful priesthood that touched thousands of lives. St. Bernadette's has been my "second parish home" for many years, as well as the place where I routinely go to confession; Fr. Pete was often the priest behind the screen, hearing my sins and giving me gentle spiritual direction and absolution. When he celebrated the Holy Sacrifice of the Mass, it was always reverent, and his joy in the Lord--and his beloved parishioners--was clearly evident. "Thank you for all the times you absolved me of sins and gave me Jesus." Our priests sacrifice everything to give us all. May we never take them for granted. May the soul of Fr. Peter Rossa, and the souls of all the faithful departed, rest in eternal peace. 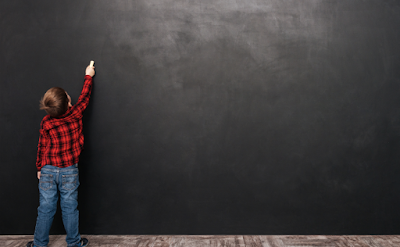 What can a divorced parent say NOW to their children to help them heal? Hello, Strangers (unless you've been following me on Facebook, and in that case, we know each other better than ever)!! What could your parents say to you NOW that would help you heal from the legacy of their divorce in your life? What would I like to hear from my parents? An acknowledgment that they let me down. ^^That is exactly where my head and heart went. I think I would also stress the spiritual jeopardy that I was placed in by their choice.....we view God the way we are parented......that their actions haven't just hurt earthly relationships, but heavenly ones, as well. YES. "We were stupid and selfish. We should have tried harder. We should have valued our family, and the health and well-being of our children more and fought for our family." They could say: "I loved your mother/father. I am sorry I hurt you. I would try harder if I had the chance to do it again." What could they say? They could say "we're getting back together." I was so sad when my dad got remarried and it became apparent that it would never happen. I know I'm not the only kid that held out hope for a reunion. For me this would be devastating. I would feel like my parents put me through 40 years of garbage for absolutely no reason. I don't need an apology, just an acknowledgement that it has been incredibly hard for me and that it took things from me I otherwise would have had. Saying, "I'm sorry, I love you," then ask how I feel, listen to me and talk about it. I will say, my mom did write me a letter when I was in college telling me she was sorry that her marriage was not a good example for me. I really appreciated that. Wow, I'm not sure what to say. I don't think my parents ever said anything like this to me, but I wish they had. My mom acknowledged it to me regarding my sister, because my sister went down the wrong path, got into drugs, went to jail for a time, etc., and my mom acknowledged that the divorce was so hard on her, that it was probably a big part of why she went down the path she did. I would just want them to say, "I'm sorry" and express regret, remorse, and acknowledge that they knows it's harmful and it hurts, and if there's anything they can do to help their children cope, that they will do it. And if the kids need to talk or vent without judgement, they will listen. And then mean it. How about: "My Child, I am sorry to have caused you all this pain. It was a difficult, painful time, and in my ignorance and blindness, I chose a selfish, sinful path, and your family was broken. I should have tried harder and done the work to fix what was wrong and loved your mom (or dad) the way she (or he) deserved. I should have honored my vows and been a better example to you and your siblings. Please don’t follow in my footsteps! I love you and pray that you can make your marriage last a lifetime, and that your own children never have to go through the pain you have suffered." Oh my, I love this. Thank you. This hits all the sore spots! I would want the parent to ask me how I feel and what I went through and listen. That's all. I agree, but I needed to hear their sense of sadness and regret, too. Would you be able to tell them? I still don't know that I could. Not to my mother that is for sure. My dad has been open, but I'm not sure how to express the pain. It was awful. Things that were said to me that helped: "I loved your father very much and wanted to be with him for life. I was very sad about the divorce." And from my father (during a small window where he seemed to get it): "I feel like I messed your childhood up. I'm so sorry. I regret so many things. Please forgive me." Also optimism and confidence that I can lead a great life, and that my parents are proud of me. My mom in particular always approached things with both empathy and a can-do, we're in this together attitude. Nice. Just about everything I want to hear. As for what to say, I think a simple recognition of the failure and its subsequent trauma is enough. Don't justify it, don't smooth it over. And for God's sake, don't tell them that it was "meant to happen" (my mother said this to my young daughter). Don't badmouth each other. Usually, kids love both of their parents. Be grownups. You already messed up by getting a divorce, don't make it worse by making the kids choose sides. And, actually listen to what your kid wants to say without making any excuses. Here's an unrealistic request: How about a long litany of the events that happened in life and how they could have been. (Birthdays, vacations, concerts, sporting events, conversations needed in high school that didn't happen, etc.) Seriously, an acknowledgement of what should have happened at those important times, even if not a comprehensive list, would go a long way to show that the parent "gets it." I don't think there is a particular set of words to say; but the acknowledgement to the child that the dysfunctions and divorce were hurtful to the child will go a long way in healing. I am very blessed, in that my dad did ask me, not too many years before before he died, if I were angry with him for divorcing my mother. My dad's acknowledgement that I suffered means a great deal to me. So much has already been said here. All I would add is how children need to hear that they did nothing to cause the divorce and that they are blameless. There was more, but you get the gist of it. Guys, there is a world of hidden hurt out there and it needs to be addressed. May God bless all the children of divorce. On September 28 at 2:00 pm EST, I am going to be a guest on EWTN's At Home With Jim and Joy! The show will be live, and then it will be repeated a couple of times. I will also be taping an episode of EWTN's Bookmark with Doug Keck! I hope everyone in the Bubble family will tune in! More info to come as we get closer! 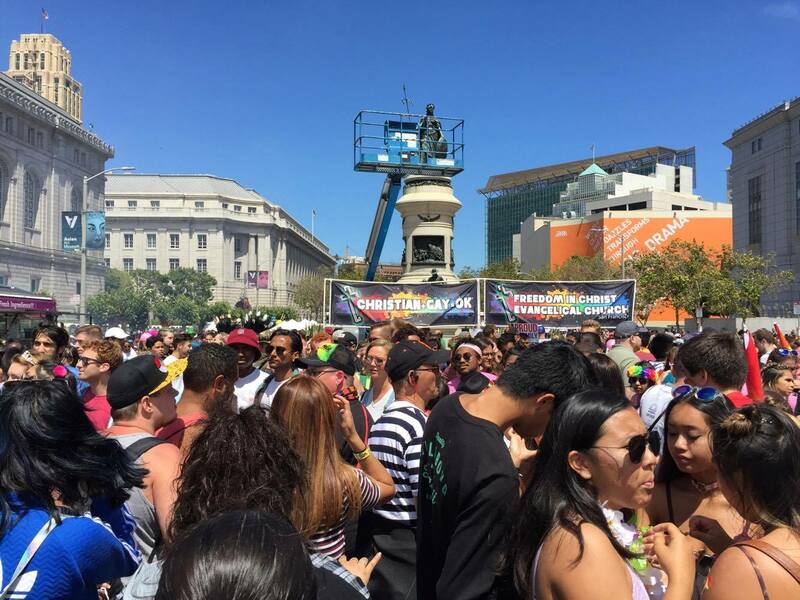 At the wholly unexpected prompting of the Holy Spirit, my friend Rob Marco flew across the country less than 24 hours ago to join one of my heroes, Joseph Sciambra, in his ministry to the LGBT community at the San Francisco Pride event, where around a million people gathered. As Rob sat at the airport ready to board his flight home just moments ago, he sent me his reflections, below. God bless Rob, Susan, and Joseph for their love and courage. The first reflection is that everyone was pretty pleasant and free-spirited for the most part. There was not a lot of belligerence, no yelling, and minimal confrontation. These are not "bad people," but as I see it, they are lost, hurting people, and there are also other people just going along with the crowd. There were a lot of drugs in the air, you could smell it everywhere, so maybe people were just "happy"--I don't know. Joseph [Sciambra] is very mild-mannered and polite, and admits that his presence there is a bit of a Johnny Appleseed operation. People didn't know what to make of us. I think they were so pleasant because there were many gay-affirming churches present at booths, and I guess they thought we were just members of another one of those churches, since we were wearing shirts that said, "Jesus loves gay men and women"--which is true, but hard to go into it on the street, the truth that Jesus everyone without exception, loves us so much he wants more for us than what we degrade ourselves to. 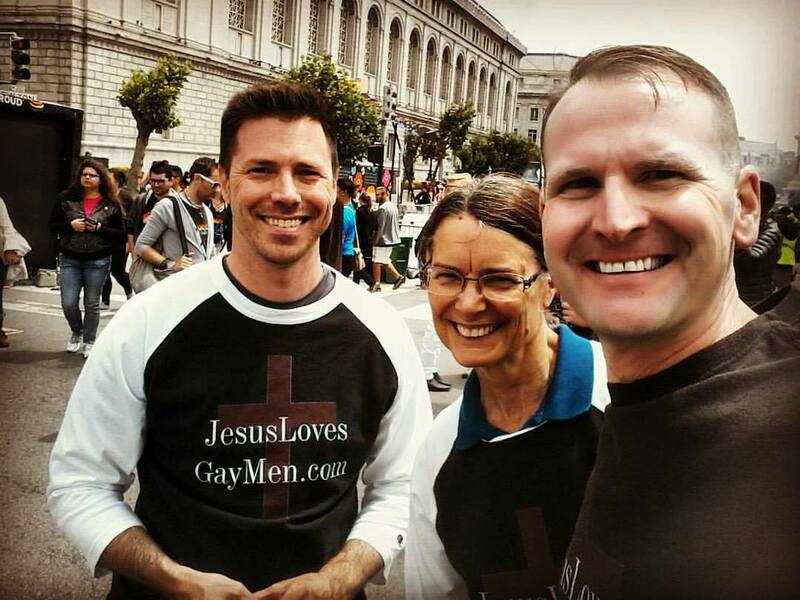 Many "gay-affirming" churches were represented at the event. It was boots-on-the-ground ministry and hard to connect one-on-one, so we gave out rosary bracelets and a card with Joseph's website in the hopes that they will visit the site at home after the parade, when things aren't so crazy. 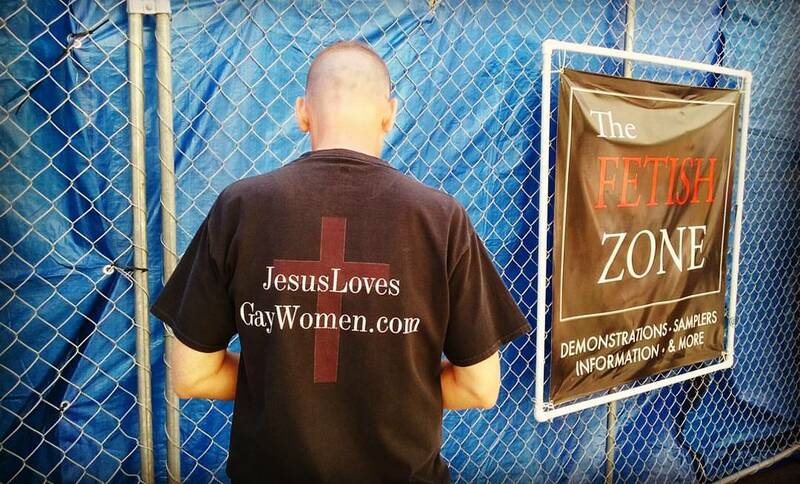 Joseph said his site gets about twenty times more traffic than normal in the days after Pride. I remember the first post I read when I found his website was "Hell is For Real" about his near-death experience. I think that's what struck me about the day, and what I made mention to Susan: this parade, this world...it's not reality. It's somebody's reality, but it's not what is really true and really real. It is as if there is a cliff behind the curtain, and nobody really sees it. For four hours, I wore a smile (a genuine one, mind you) and said more "God bless you's" than I could count. But on the inside, I was breaking up at the offenses against our Lord, the perversion. I offered up to the Lord the soreness, the sunburn, the hunger and thirst--in the hopes that he would pardon such offenses, an act of reparation that pales with what he endured on the Cross for us. Something interesting to note as well: This really was a quasi-religious event, albeit not in the traditional sense. There was a procession of sorts, down Market Street. 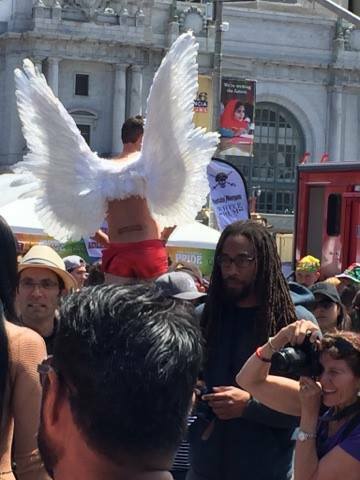 There were men in underwear dancing on platforms wearing angel wings. One man was dressed as the pope in mockery, blessing people...another dressed as Our Lady, a kind of blasphemous Madonna. Why would they do this? 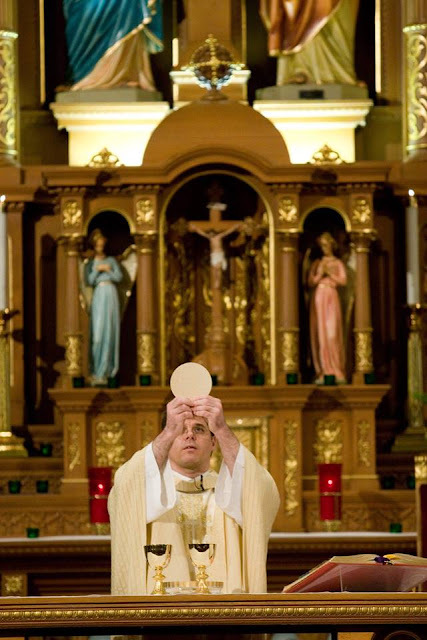 Like Satanists who do not have Black Masses at a Methodist church, or an Episcopal church, or a Baptist church...they mock the Catholic Church, and desecrate the Eucharist. And it was very similar here. Satan mocks, and he doesn't bother to mock the things that have no power. But there was also a hunger here, a hunger for God and what is religious and even Catholic...but not on God's terms. It was a perverted substitution. There was also a legitimate sense of a craving for love and affirmation, but somewhere along the line a hurt, a trauma maybe came in and something must have failed along the way. Joseph has written about this. You wouldn't believe how many rosary bracelets we gave away; people wanted them, but in a way in which they did not understand. There was dancing and laughter and happiness, but it felt like a façade, because, like Joseph, I know what's on the other side. It is easy, so easy, to go along with what is around you, when you are surrounded by it as the majority...and it's even seen as good. But it was like...I felt like I was in an alternative universe where everything was upside down. It didn't shake my faith, but it made me fearful of God's judgment. God has been so patient with us, and I think that time may be running out, and so I pray the rosary every day. And, if anything, flying out here has convinced me to start fasting and offering up sacrifices for conversions. Because there is really nothing we can do on our own, the force against us is too strong. We need God. NEED Him. And prayer is an indispensable weapon in this fight. One thing that bothered me was seeing children at an event like this. I thought of my own children, and so many other children...toddlers, pre-teens, and adolescents...who are just being born into this confusion and won't know any different. Joseph made an interesting point, too, that there were many corporate sponsors of the event, a lot of backing. It felt like Goliath, honestly...a powerful force to be reckoned with. I felt like a needle in a haystack. I had peace and an assurance of being on the 'wrong side of history,' because it was evident that this was the history of man, not God, for God is not the author of confusion (1 Cor 14:33). It made my heart heavy, but only because, as a Christian, I was finally entering into the fray; it was new to me personally, but not new to human history, for the world will hate us because it hated Him first (Jn 15:18), and we'd better get used to it if we want to be Christ's disciples. Joseph praying in front of the "Fetish Zone." I can't help but think the Church has let people down. I'm not talking about the Catechism or the Holy Spirit's assurance that the gates of Hell will not prevail against Her. I'm talking about waffling and wavering in practice. The temptation to be liked is so strong, and I'm sure those in ministry and pastoring have made the mistake of capitulating so as not to be hated. Well guess what? If you're not hated for your faith, it should give you pause. Because we are past time for dialogue and understanding. You'd better pick sides and get on your knees when you see what we are up against, and the way Satan has his way in the world. Now, I'm late to this fight, so maybe I'm just as much to blame. But the narrow path is becoming more clear to me as the only way to be saved. It should have been clear from the start. I'm tired and sunburned, hungry and thirsty, and I thank God and give Him praise for the opportunity to offer up these pittances and to taste some of the derision and sorrow He experienced as He hung for us, men of the mob who favored Barabbas over the very Son of God. I don't know why He called me fly out here from Philadelphia. I hope maybe we touched one person. God bless Joseph for his endurance and compassion and commitment to Truth in a way that is not always understood or accepted as normative, and for loving and ministering to people to whom most of us would not minister. What a blessing to go into the trenches with him, even if just for a day. And thank you, thank you, thank you for all your prayers; they sustained us for sure. Patrick Coffin interviews me, re: Primal Loss! Enjoy this video interview with the wonderful Patrick Coffin, as we talk about Primal Loss: The Now-Adult Children of Divorce Speak. Please excuse the pink walls in my house (long story)!! Teach Them the Natural Law! Bubble readers, you are ahead of the game, because we have been talking Natural Law here for years! Now is the time to really step it up, and teach our children. After all, we live in a culture that, quite literally, rejects reality itself, so it's a real gift to be able to give our children a firm footing that makes sense, while the rest of the world is falling. By grounding our children and ourselves, we can then be in a position to help others climb out of the chaos. And as a reminder, if you miss the conversations here on the blog, I'm quite active on Facebook, and you can friend me there. Just please write me a note when you send a friend request so that I don't confuse you with a troll. This is a "what I've learned" post. It's late, and I'm tired, but sometimes my clearest thoughts come when I just commit to throwing them out on the page, stream of consciousness. As you may know, I've been immersed in a subject that, up until a few months ago, held no real interest for me. 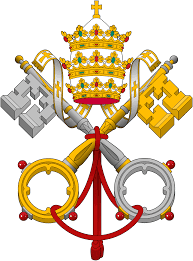 I have been teaching the Catholic faith for some 23 years now, and a huge focus for me has been marriage, family, human sexuality, raising up holy Catholic kids, fighting the culture war on the redefining (un-defining) of marriage, etc. And in all of that teaching, for over two decades of my life, I never much cared or thought about the issue of divorce, aside from lip-service... "Oh, divorce is bad. Yep, it's bad. We Catholics are against it. Yep." 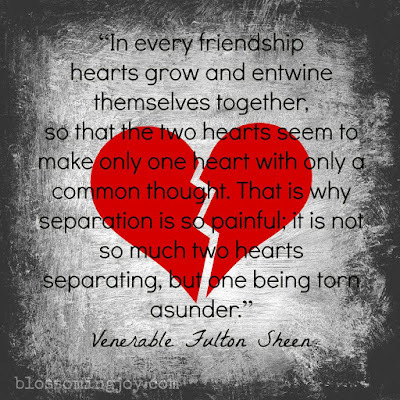 And in the meantime, I have looked the other way for the most part, or even tacitly approved of some friends' divorces (much to my shame now). Every now and then I would write a blog post about the cop-out that is most divorces, and sometimes I would counsel a Catholic woman not to divorce (usually after the rest of her Catholic girlfriends told her to go "be happy"), but then I put it out of my mind and went back to my intact, uncomplicated life. <----- a fact I never realized until I discovered the complications children of divorce deal with every day. Oh.my.gosh. Never in a million years did I think divorce would be "my issue." I simply have no real connection with it. It has not touched my life in a meaningful way. What I now understand is that I was blind. I had no idea what was going on all around me, and I couldn't see the walking wounded of divorce, because so many of them appear so incredibly successful and put together. Maybe it's more accurate to say that I didn't hear the walking wounded, and neither do you. But that's because--and here it is--they don't speak. Because of the silence and the hidden pain, these adult children of divorce did not even know that there were others like them! I could write several blog posts just on that point alone, and how the knowledge of others who understand them has been a huge relief and help in healing. One contributor compared the knowledge and friendship of the others to a reunion of "old war buddies." They are all veterans of those wars, indeed, but they thought they were the only ones still nursing the old shrapnel from the explosion that blew apart their families--and their foundational security. And that leads me to what I really want to say: The absolute disbelief I have at the unwillingness of much of the general public to hear what the children of divorce have to say. I can't get over it. Every time I post the words of the children of divorce on my Facebook page, two things happen. First, I get a flurry of responses from children of divorce (or abandoned spouses), thanking me for giving them a voice. Usually this is done via private message, so as not to out themselves. One woman went so far as to question why a book like mine was even written. She asked, repeatedly, What purpose does it serve? Why is it published at all? In fact, a book like mine, she said, should not be published. I kid you not. So, what is this deeply offensive book? Aside from the introduction and a few other components, it's not my words. In fact, the bulk of the book consists of eight chapters that contain not a single word of mine. Eight chapters of "no Leila." I did not "write" the book. The children of divorce wrote the book. They answered eight simple questions posed to them about their experiences and feelings and thoughts about the breakup of their families. I did not cherry-pick and I did not censor. I let them talk. And yet, that, apparently, is going too far. A question I have taken to asking those who resent the book's existence: Do you think that the voices of the children of divorce are too frequently heard? Do they talk too much? Is their view presented too often? Or...could it be the opposite? Could it be that the adults, the divorced parents, the culture of no-fault divorce get the bulk of the time and attention and sympathy? If we are honest, we know it's the latter. Seeing how quickly the children of divorce are pounced upon and their perspective invalidated, I now understand why they don't speak, or only speak anonymously (and even then, with terror of being found out). Grown men and women, afraid to say how they really feel about their parents' divorce, even decades later! Why? Because they don't want to hurt their parents, whom they love; because they don't feel secure enough to tell the truth (if one has seen that conflict leads to permanent separation, one learns to avoid conflict); because the divorce narrative cannot be contradicted without serious consequences and penalties; because when they do speak, they are reminded--scolded!--that they are wrong and the divorced parent is right. I've seen it happen now, with my own eyes, and it's as shocking to me as it is (now) predictable. When my friend Alishia (the inspiration for the book) told me carefully worded and oh, so casual stories over the course of a few years about the effects of her parents' divorce on her life, I encouraged her to write about it--but she always demurred. Turns out, it was wise that she did not write her own book, as that would have set her up as a target... which would have been devastating. Not only would she have been accused of having an ax to grind against her parents, but she would've had to beat a hasty retreat from the onslaught, to protect herself emotionally (something children of divorce learn early). Okay, it's late (actually early). I've got to get to bed. But please, allow this book to have its place in the divorce discussion. Let the children of divorce have their small say. We hear from the divorced/divorcing adults all the time. Surely there is a little place at the table for those who are most affected and least able to have any say in the break up of their families. And please, pray for them. They are incredible and strong, but they have a lot of healing still to do, and I hope we will allow them that. And the healing begins by giving them their voice and actually listening to what they are telling us. Related posts: Should the Children Sit Down and Shut Up? Join us on Facebook tomorrow morning if you'd like, for the release event! Yippee!!! The paperback of Primal Loss: The Now Adult Children of Divorce is here and can finally be ordered! I had to CANCEL the e-book indefinitely (all who pre-ordered will not be charged for it), as I discovered JUST NOW (yes, I'm having a heart attack) that the e-book I uploaded is an older, unedited version.... I am so sorry, and please forgive me if you pre-ordered the e-book. I hope to rectify that soon. I just uploaded the correct version and hopefully it will be back online and available in the next day or so! Whew! Again, my apologies if you were one of the pre-orders. God willing and the creek don't rise, my second book, Primal Loss: The Now-Adult Children of Divorce Speak, will be in your hands on May 22, in both e-book and paperback format (the ebook, and only the ebook, can be pre-ordered here). If you haven't been following all the conversation and drama on my Facebook page over the past few weeks, I want to give you a little taste of it here. Primal Loss records for us the actual pain of those most wounded by divorce--children. This makes it countercultural in the best of ways. Some suffering today is not allowed to be called suffering. It is not politically correct to say that children suffer greatly from the divorce of their parents. This book needed to be written, and it needs to be read. It will help children of divorce know that they are not wrong in feeling this awful loss, which, once named and brought to Christ and His Cross, can find healing and even be redemptive. It will help all who bear wounds caused by broken marriages, including divorcées themselves, not only to see in truth what has happened, but also to seek the One whose mercy is greater than our sins and whose Cross is our only hope. “For I hate divorce, says the Lord” (Malachi 2:16). In Primal Loss, adult children explain the life-long impact of learning that horrific concept that “love stops” because their parents divorced. These voices must not be snuffed out by the political correctness that has silenced the suffering brought on by actions that are deemed sinful by the Church. “Open thy mouth for the dumb, and for the causes of all the children that pass” (Proverbs 31:8 Douay-Rheims). We all need to listen to the voices in Primal Loss because their pain is significant and motivating. Those in marriages will be inspired to elevate their relationships and inoculate against divorce; those who have suffered should take comfort that they are not alone, and that hope and peace can return. —Diane Medved, Ph.D., psychologist and author of Don’t Divorce: Powerful Arguments For Saving and Revitalizing Your Marriage. Reading Primal Loss is akin to watching footage of the Hindenburg disaster. Its message is so rivetingly compelling that it's impossible to tear your gaze away, even though it documents a profound tragedy. Regardless of your current views on divorce, this book will impact you deeply." Primal Loss is shock treatment for anyone rationalizing the effect of a broken home on a child. Leila Miller presents the raw words of adult children of divorce, exposing the myth that “the children are all right.” Every pastor and counselor should read this book! 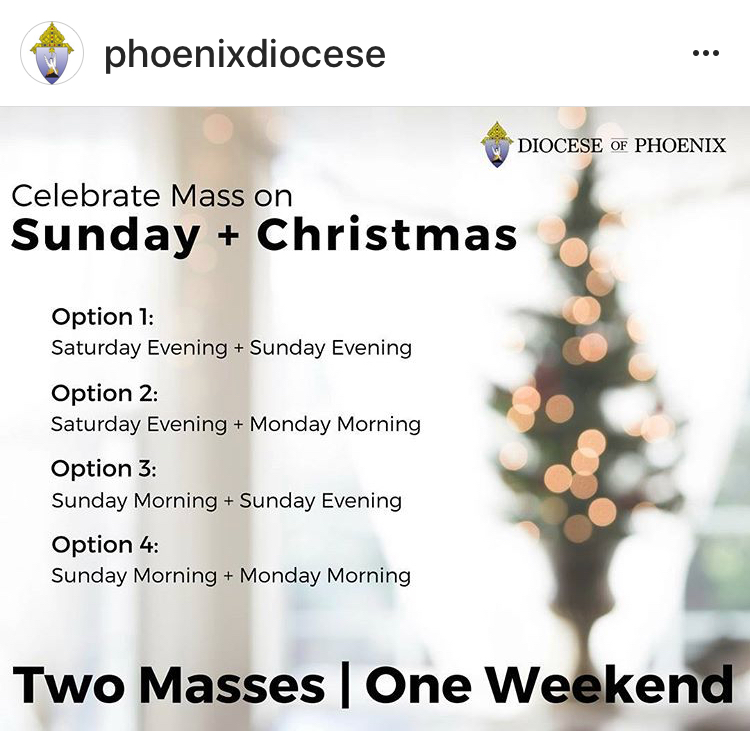 Please share that homily with any children of divorce that you may know. I am not a child of divorce, and I knew very little about this whole subject before I started this project. One thing I have learned--and which has shocked me--is that most children of divorce, even decades later, have never been asked by anyone how they feel/felt about their parents' divorce! They may be asked about why it happened, when it happened, how it happened, and even how their parents are doing, but rarely does anyone ask the child himself. Even therapists seem to give coping or communication skills, but apparently many (most?) do not ask how the child feels and what his thoughts are about the divorce itself. “If I’m not the daughter of Mr. and Mrs.____, then who am I?" For these adult children of divorce, the floodgates have been opened. How many others, millions, have never said a word? Pray for all those who live with the pain and the scars of divorce every day. PS: Due to some very unfortunate events, I have had to put the comments on "moderate." Thank you for understanding.